Bishop Alphonsus Cullinan with a group of Irish delegates at SEEK2019. 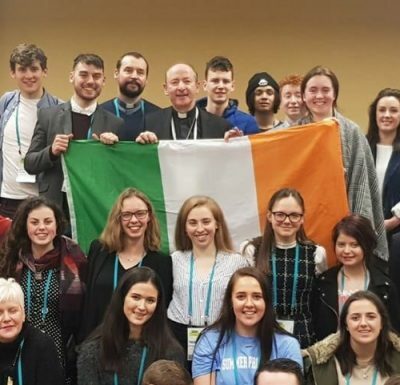 More than 17,000 people attended the SEEK2019 conference in the United States, including 60 delegates from Ireland. The conference was hosted by the Denver-based Fellowship of Catholic University Students, or FOCUS. It was held between 3rd and 7th January in Indianapolis, and featured key note addresses from well-known Catholic figures such as papal biographer George Weigel. On the opening day, the founder of FOCUS, Curtis Martin, encouraged participants to recall the real purpose of their lives – to seek heaven and live out their mission here on earth. The Irish delegation included college students, a bishop and four priests. Bishop Alphonsus Cullinan of Waterford and Lismore, invited to the conference by FOCUS, said the whole event was a celebration of faith. Among the talks he attended were those from Scott Hayn, theologian and author; Leah Darrow, international Catholic speaker and former model; Dr Edward Sri, well-known Catholic speaker and regular contributor on EWTN; Chris Stefanick, founder of Real Life Catholic; and Anna Carter, the co-founder of Eden Invitation, a movement promoting solidarity beyond the LGBT+ paradigm. Jack Ryan, 2nd year accountant student at UCC, said the talks were inspiring. “I’ve watched some of the speakers on YouTube, and to meet them in person was special. I do think the biggest thing people brought away was meeting the other people, especially to meet the Irish groups and make connections and feel that kind of support around us,” he told CatholicIreland.net. Bishop Cullinan said he was inspired by the faith of the young people at the conference. “There are wonderful things happening in the young Church,” he added. In the United States 80 per cent of people who leave the Church do so by the age of 23. “Is Ireland any different? Or worse?” asked Bishop Cullinan. “Our social problems are mounting but our love of Jesus Christ diminishing. Mr Ryan said the conference had encouraged him to be more focused on sharing his faith. The five-day event marked the 20th anniversary of the first Fellowship of Catholic University Students conference. According to founder Curtis Martin, in those decades, the conference has grown from 20 students from Benedictine College to include more than 17,000 attendees, with thousands more watching online. Currently FOCUS has nearly 700 missionaries serving on 153 college campuses in 42 US states and five international locations. Founded in 1998, FOCUS’s purpose is to nurture the Catholic faith in college students.